Delight your subscribers with awesome, personal emails. 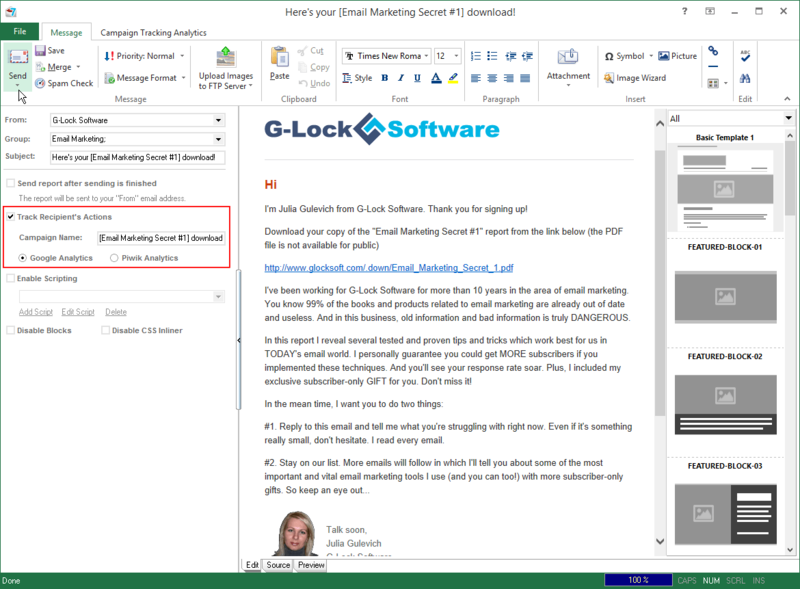 With G-Lock EasyMail7 you get a powerful, IN-HOUSE email software for permission based email marketing that helps you create and deliver awesome, personalized emails to your customers. Quickly build fully-customizable drip campaigns for all your needs. 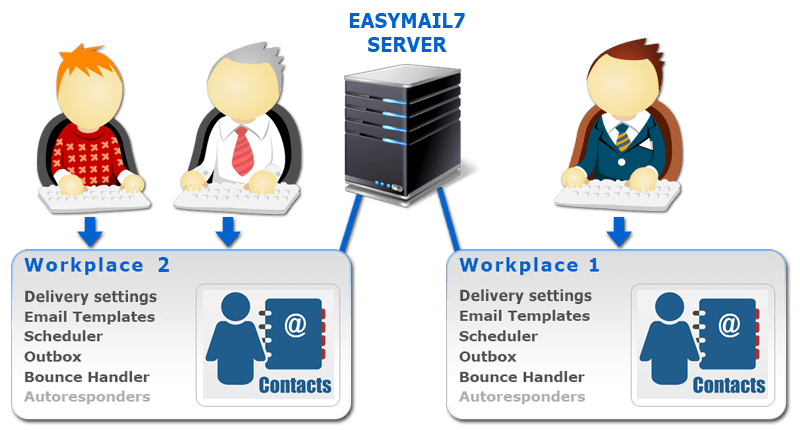 EasyMail7 doesn’t replace your existing mail server or delivery service. It provides a single, user-friendly interface that allows you to work with multiple delivery vendors or your mail server. You can send the right email at the right time with dynamic content and flexible email scheduling. Optimize deliverability with 3rd party email senders like Amazon SES, Sendgrid, Mandrill, etc… With EasyMail7, CAN-SPAM compliance, bounce and unsubscribe management is automated. 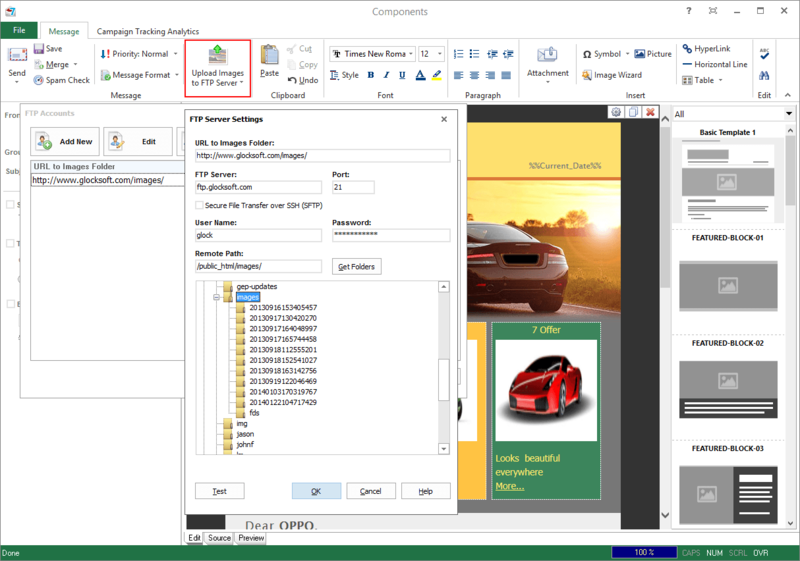 EasyMail7 is the powerful, in-house email marketing software for Windows® built on a client-server model. 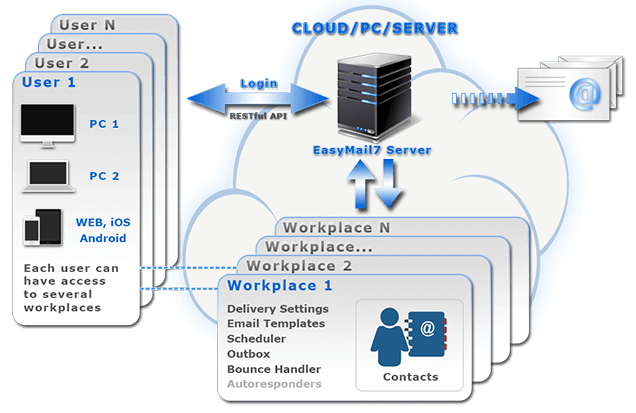 You get two components: EasyMail7 Server and EasyMail7 Client. 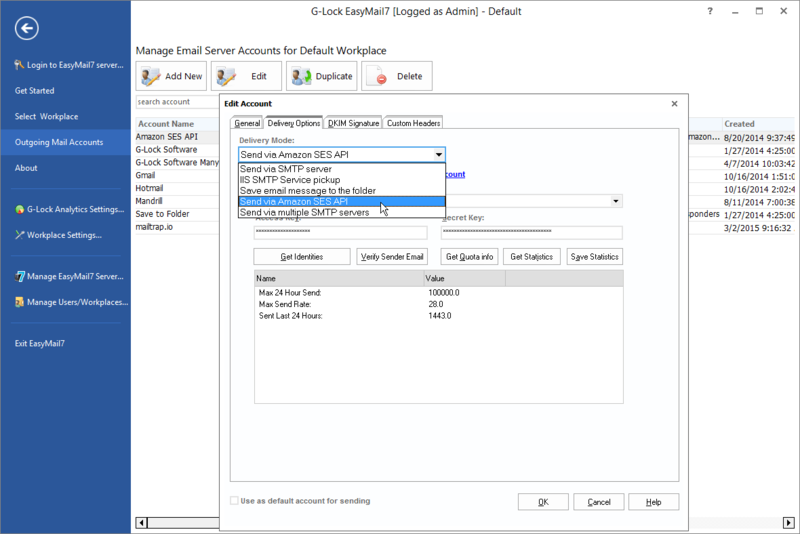 You can install the EasyMail7 Server on a local computer, or on a network Windows server, or on a cloud-based server for example Amazon EC2 or Windows® Azure Virtual Machine. * A workplace includes email server accounts, email templates and drafts, sent items, contact groups (internal and external lists), scheduler, and Bounce Handler. You think you are sending great campaigns, but your emails may be marked as spam by numerous spam filters and not reach the Inbox. What if you were able to diagnose and fix deliverability issues before sending the message to your list? In the past, testing email placement used to take a lot of time and budget. 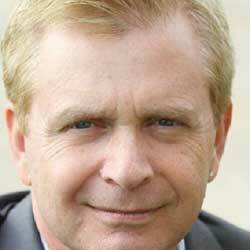 You would need to setup dedicated testing computers in your office and create email accounts with different ISPs, or use a 3rd party email monitoring service that would charge you a fortune. You can test how your message is treated by major Internet providers around the world and see whether it is delivered to the Inbox, spam folder or blocked before reaching the recipient’s mailbox. In Gmail, ​you will see if your message is delivered to the Primary, Social or promotions tab. To keep peace in your mind, EasyMail7 automatically creates backup of your data which includes all users and workplaces. You can adjust the automatic backup settings as you want and schedule the backup creation for the night when the server is not overloaded. Or, you can turn the automatic backup to off and create backup manually whenever you want. Backup is made online which means you can work with the program without any interruption. 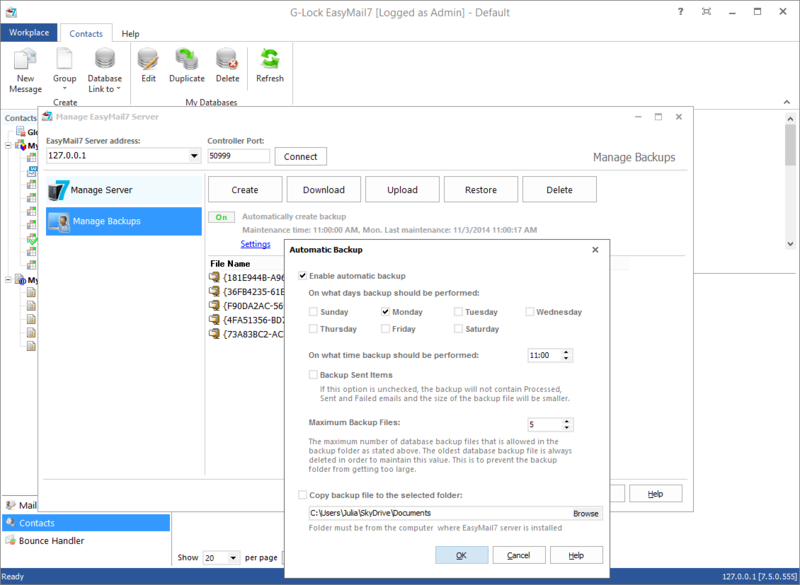 As a rule, backup is saved to the EasyMail7 Server but you can optionally choose to save a copy of the backup file to any local folder, or a cloud file storage folder such as OneDrive, DropBox etc. If you decide to switch email sending services, you can safely do it without losing your contact list, autoresponders, and other data. Unlimited groups, subscribers and custom fields for email personalization. 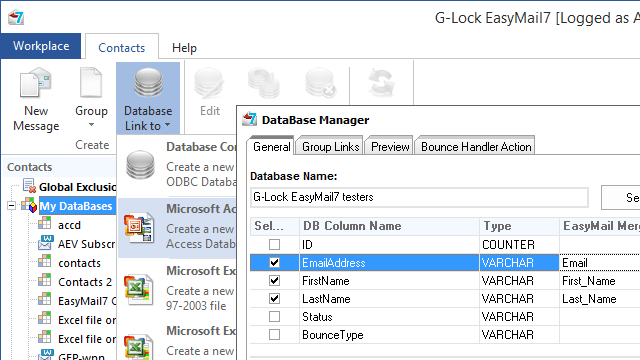 EasyMail7 can connect to any ODBC compatible database on the network like MS Excel, MS Access, MySQL and send the message to the contacts by taking their emails from the database. No need to export-import the recipients into EasyMail7 every time when you update your database. Targeted and highly relevant emails increase click-through rate by nearly 3 times. You can search for contacts in the group that have specific characteristics in common and save these contact groups as segments, that automatically populate over time according to the criteria you set. 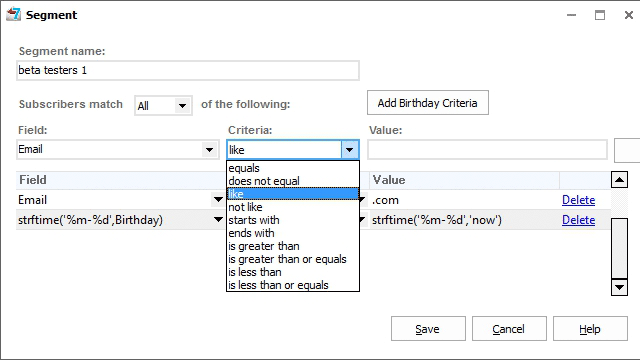 You can choose your segment criteria based on the qualities, interests, locations, date of birth, subscription date etc. etc. and target your emails to match the interests of each segment. You can define lists of addresses or domains which will be automatically excluded from mailings. You can have the unique exclusion list for each group and Global Exclusion List that works for all groups at the same time. The program will not send messages to the contacts that are on the exclusion lists. In addition, there is the Global Exclusion List (workplace-wide blocklist) that works for all groups at the same time. „Got to admit. I'm impressed about the support we get from G-Lock staff from the first day. Julia and Dimitry were able to help me get up and running really quickly. Their support was key for me to first answer to all my questions and second get moving with our first campaign. Beautiful emails, across all devices. You have full control over your messages. 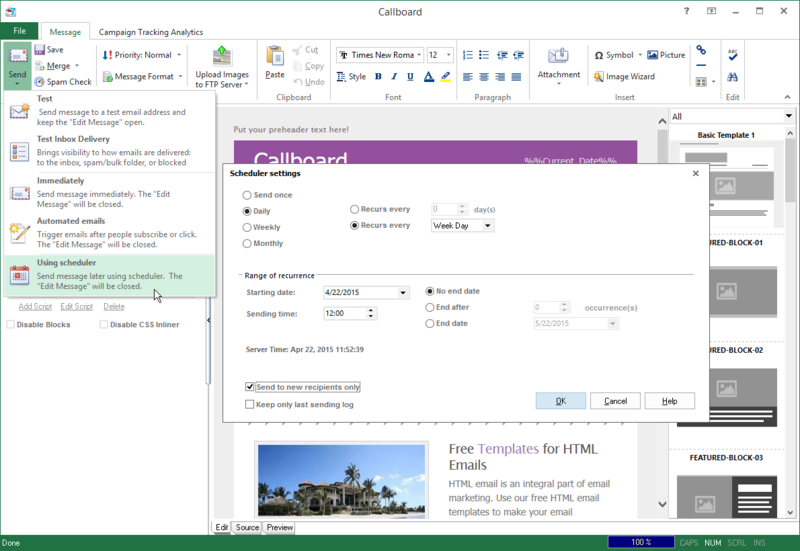 EasyMail7 includes a fully-featured context-sensitive message editor so that you can create a HTML email directly in the program. You have unlimited customization options (body, header, footer, colors etc.) for your templates and messages. 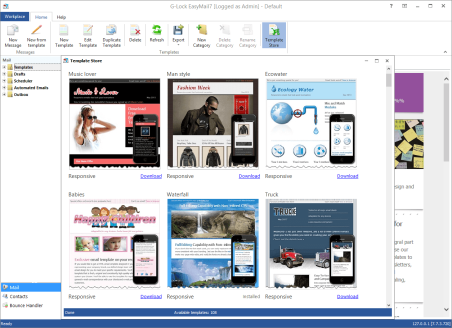 Plus, you can create your own layout in any standalone HTML editor like Adobe DreamWeaver, FrontPage, or Microsoft Expression Web and load it in G-Lock EasyMail7, or you can download beautiful HTML email templates from our store and use them to design responsive email newsletters. 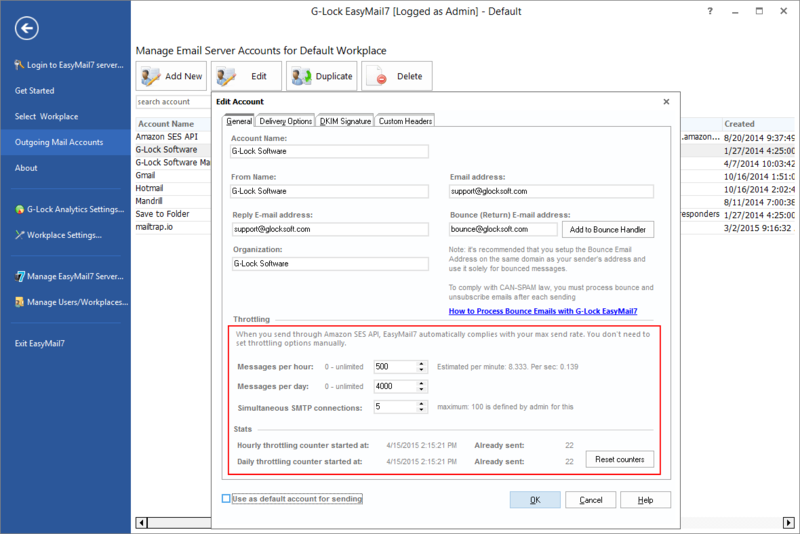 In addition to a common attachment, with G-Lock EasyMail7 you can send a personal (unique) attachment to each subscriber. For example, you may want to attach an individual .pdf invoice or receipt for each recipient. „We are an IT solutions company like you, but in the field of accounting and payroll applications. Import your subscribers, add any smtp and send emails at a fraction of the cost it would have been with any ESP! Just remember – a fully confirmed opted-in list is important. 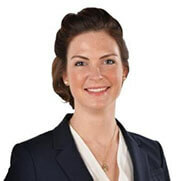 It is a general prerequisite for sustainable e-mail deliverability and conversion rates. 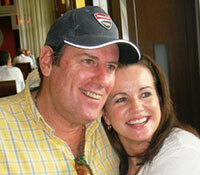 „I have been throwing money away year after year with Mad Mimi, Constant Contact etc. Close the loop on your email marketing efforts with powerful analytics. 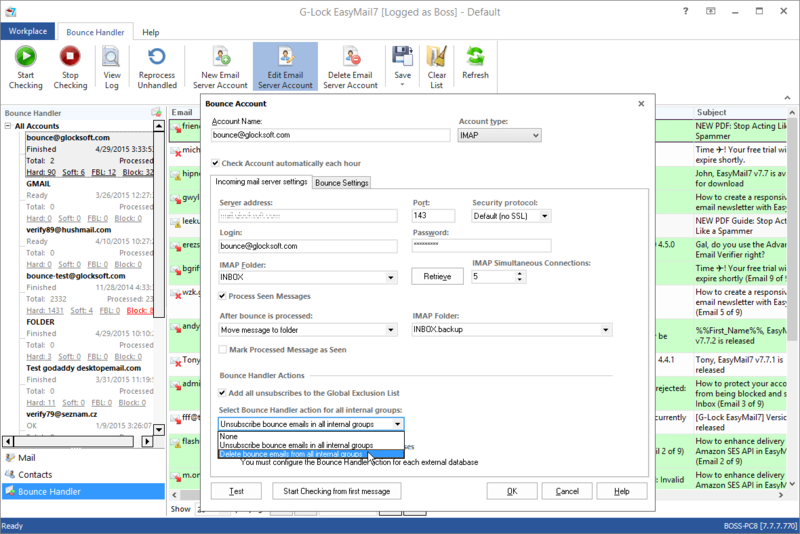 G-Lock EasyMail7 is integrated with G-Lock Email Analytics, Google Analytics, and Piwik Analytics tracking services which means you can instantly know if the subscriber opened your email, clicked links in the email and visited your web site. 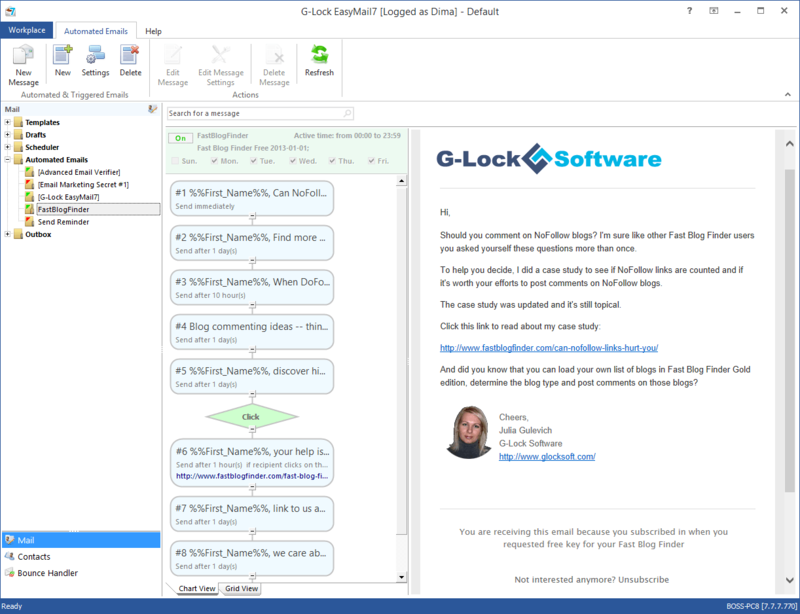 G-Lock Email Analytics* is an extremely sophisticated email tracking service that provides real time tracking: email opens and clicks, prints and forwards, geographical location and email clients the recipients use to open the email. Unlike other email tracking services, with G-Lock Email Analytics you can brand your tracking links with your domain and make them look friendly for your recipients. 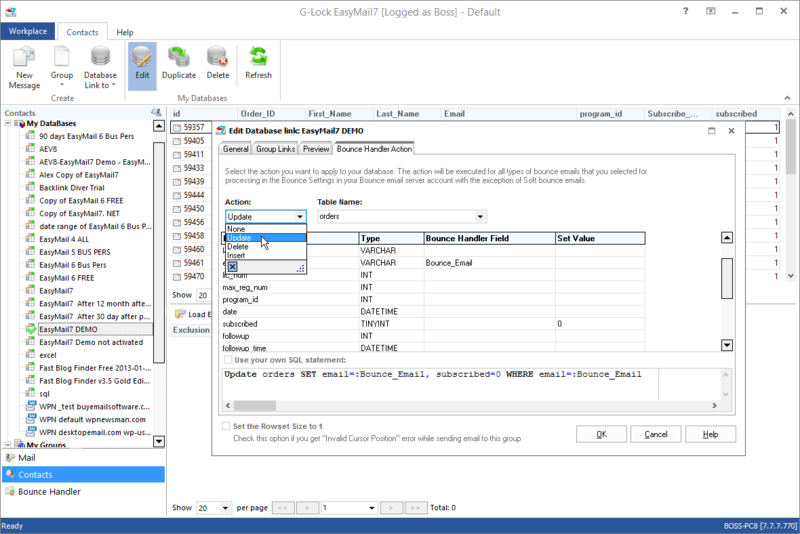 * G-Lock Analytics is a standalone service. 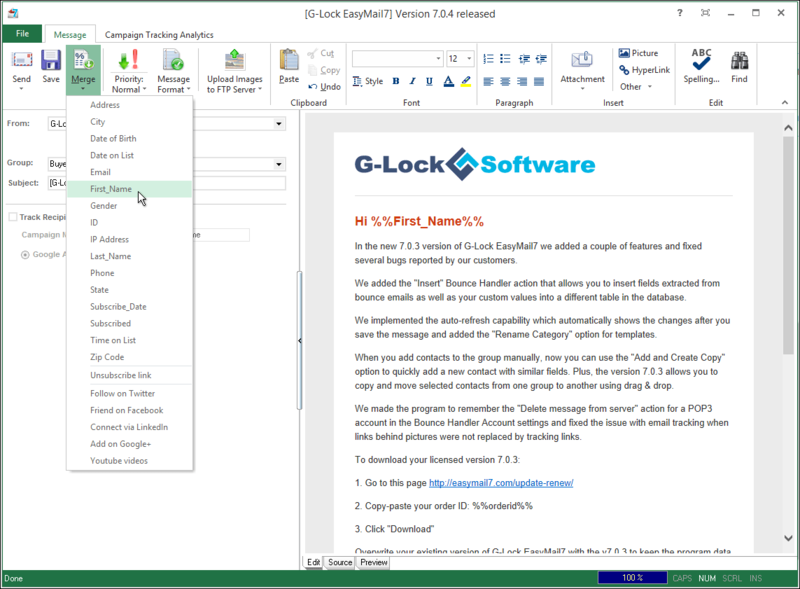 The price for G-Lock Analytics is NOT included into the price for G-Lock EasyMail7 license. 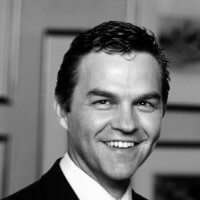 Keep your list up-to-date and protect your good sender reputation. 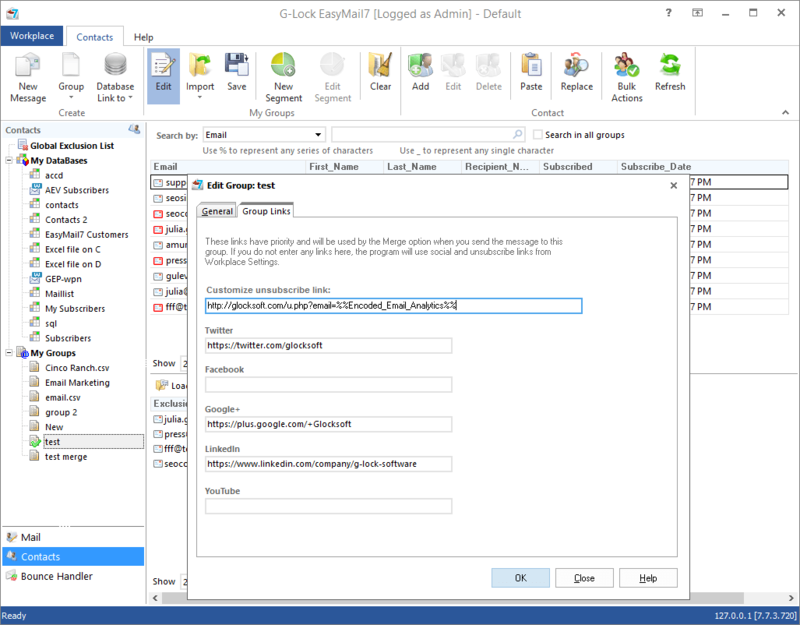 Compared to other email marketing programs, G-Lock EasyMail7 can automatically update external CRM databases with bounce emails, insert and delete bounce emails from external databases which means you free yourself from a lot of manual work, and you don’t send again to those bad email addresses. 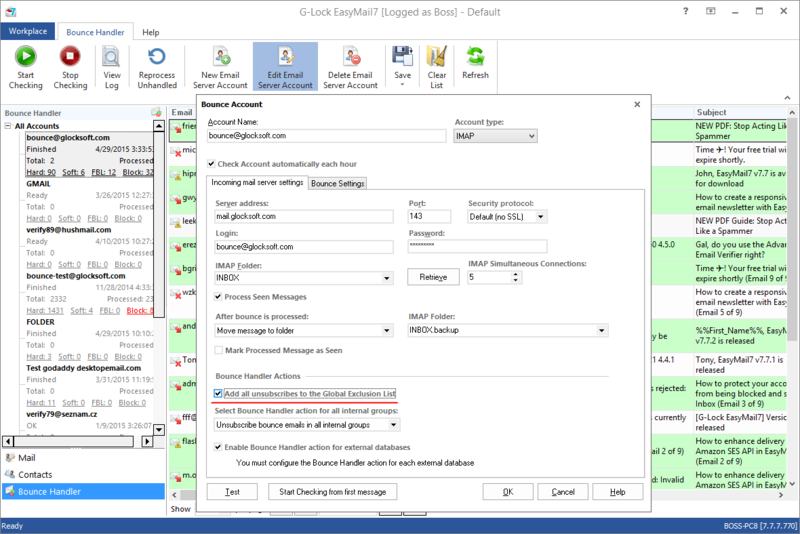 In addition to bounce emails, G-Lock EasyMail7 can automatically deal with unsubscribe messages if they have the “unsubscribe” word in the subject. 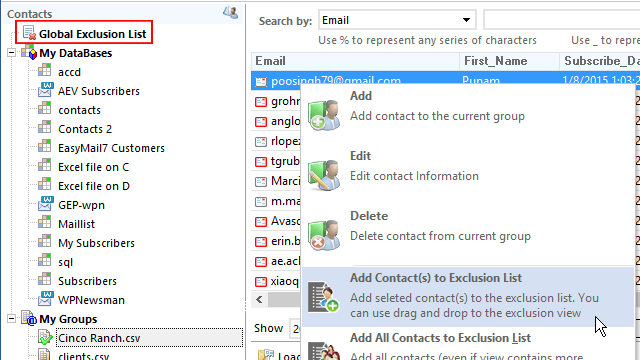 Users can be automatically unsubscribed or deleted from internal groups. You can even setup an online unsubscribe process using our free WPNewsman plugin for WordPress. Plus, our email marketing software can determine and delete transient bounce, challenge-response and auto-reply messages from the server.